. 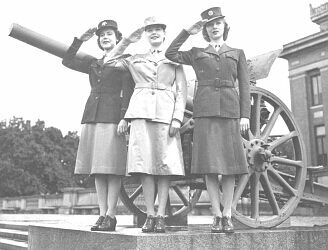 The Army Quartermaster Corps was completely unprepared to design women’s uniform garments when the WAAC was founded during 1942. Quartermaster designers and suppliers without experience in special features of the female wardrobe had much trouble to create suitable clothing. Several revisions were necessary before satisfactory garments were produced. Anyway WAAC (and later WAC) personnel was obliged to wear out stocks of already-procured bad fitting items before being issued with the improved patterns. ... Impractical materials caused discomfort when worn or shrunk after washing. Many patterns were not suited for the female body shape. For example, sizes were subdivided into L (for long), R (for regular) and S (for small) only, without taking into account that women needed special variations of bust and hip measurements. Additionally, WAAC personnel often suffered from lack of appropriate clothing for cold weather, tropical weather and certain field conditions. Some items, including shoes, were issued in the wrong or ill-fitting sizes because of supply shortages. Nevertheless, especially with the WAAC serving overseas and near the front lines, proper fitting work garments were in urgent need. 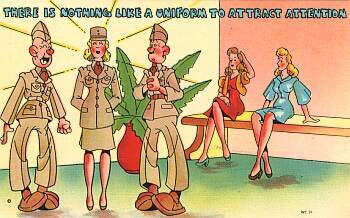 Therefore, women often resorted to wearing military male clothing which was mostly uncomfortable because of physical design differences. The Requirements Division was mainly to blame for these problems because they delayed urgent requests to supply the WAAC (and later the WAC) with necessary clothing or revised pattern items in an attempt to avoid extra costs for more issues. The general public noticed this failure. Many people thought that it was one of the reasons for diminished enlistment. Previously enlistment had been excellent during the first months after the WAAC was founded. .
. The Army colors and fabrics were adopted for the WAAC service uniforms. Dark olive-drab and light shade barathea cloth for officer’s winter uniforms, olive-drab wool covert cloth for enlisted personnel. Khaki cotton twill was chosen for summer uniforms of all categories. The WAAC uniform jacket had a 4 button closing with two slit pockets on lower front and two patch pockets. The first issued uniforms included a detachable 1 ¾” wide belt with cloth covered belt buckle. The belt was already eliminated in October 1942, as the women had shown a tendency to pull the belt too tight. Due to metal shortage olive-drab plastic buttons instead of gilt buttons were chosen. Imprinted was the WAAC eagle. Under the jacket a shirt with Army regulation khaki tie was worn. The skirt had six gores with buttoned waistband and slide fastener closure. The khaki summer uniform was made of 8.2 ounce khaki cotton twill with detachable belt. The jacket has no lining. A khaki cotton shirt with khaki necktie was worn underneath. The stiffness of the cotton twill material was often criticized as too heavy for the proper fit of women's garments.
. .. The jacket was made of dark olive drab barathea cloth. The officer's winter service uniform could be worn with a matching skirt (as shown on the left) as well as with a light shade olive drab skirt (as shown in the photo on the right) similar to the Army officer's "pinks and greens" combination. Note the Army Air Force patch on the left sleeve and the Air Force branch pins on the lapels. 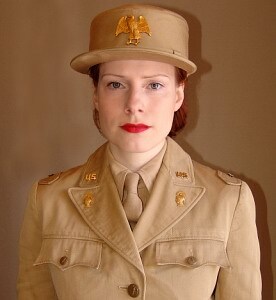 Although War Departement directives prescribed the wear of the WAAC Pallas Athene collar insignia, many air bases ordered their WAAC personnel to wear the branch insignia a man assigned to the same job would have worn instead. The left picture shows the WAAC utility bag worn on the left shoulder hanging straight down. Originally, the handbag was worn with the shoulder strap over the right shoulder and the purse resting over the left hip. ..
... The WAAC summer uniform for enlisted personnel was identical in cut and fabric with the uniform for officers. The only difference was that the uniform for officers additionally had shoulder straps and sleeve braids. The picture on the left side shows the first pattern summer uniform worn with the belt which was omitted in October 1942. Enlisted personnel wore a similar winter uniform as officers but made out of wool covert cloth in olive drab color (a shade lighter than the dark olive drab color used for officers). 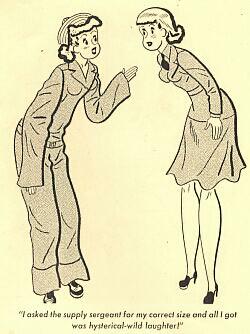 Unlike officer's uniforms, the jackets for enlisted womens had no shoulder straps and sleeve braids. They were worn with enlisted collar and hat insignia. (revised pattern) .. Due to harsh criticism of unsatisfactory fitting and material of the first WAAC uniforms many revisions had to be made. A new jacket was developed, with a better-fitting prolonged upper collar. The bulky breast pockets that caused unwanted fullness of the bust were replaced by simulated pockets with buttoned flaps. Because of the prolonged collar other parts of the jacket automatically were set lower: the breast pockets, the button closure and the slit pockets. The whole jacket was a little bit longer now as well. Unfortunately, the bottom button was set too low so that one had to unbutton the jacket for comfortable sitting. Another problem was that the new jackets were tailored by men's garment contractors and therefore became too stiff and appeared awkward. The skirt pattern was also revised. The previous straightcut of the gores caused wrinkling and rolling of the skirt. Therefore the new skrirt was rounded at the hips to fit better to the actual female figure. 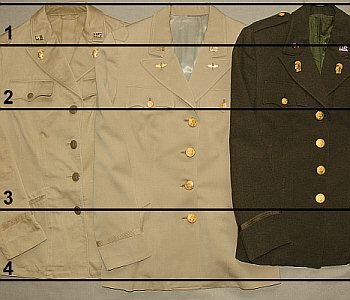 WAC pattern uniform jacket (right). All-wool tropical-worsted, khaki uniforms and caps replaced the cotton twill summer uniforms for officers. This change clearly improved the appearance of the officer's summer uniform. However, cotton twill was kept for enlisted personnel's summer uniform to save costs despite all criticized disadvantages. WAAC, Summer, Tropical-Worsted, Khaki Uniform, Officer's. This WAAC officer's uniform shown on the right was made by a private tailor in Des Moines, Iowa, where the first WAAC training camp was located. The uniform is dated June 20, 1943.